This is one of my favorite recipes to make all year round. It can be eaten plain or over a salad. 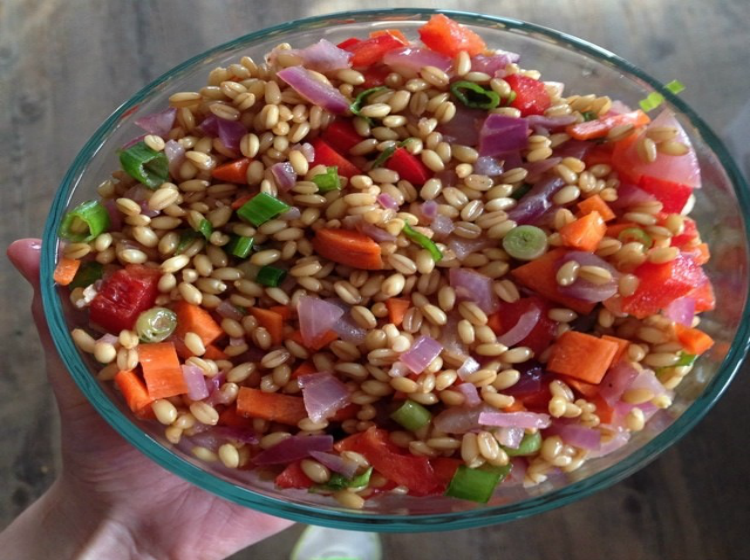 If you have never heard of wheatberries before they are a wholegrain loaded with tons of protein, fiber and Vitamin B. Let me know what you think in the comments below! + Boil 3 cups of water. Once the water is a roaring boil add 1 cup of wheatberries and cook over low heat, uncovered for 45 minutes. + Meanwhile, sauté the red onion in 1/2 a tablespoon of olive oil until the onion looks translucent. Once it does, remove from heat and add the 2 tablespoons of balsamic vinegar and 1 tablespoon of olive oil. + Cut the scallions, red bell pepper and carrot into small bite size pieces. + Once the wheatberries are done cooking place them into a medium size bowl. Add the sautéed onions in the oil, scallions, red bell pepper and carrot into the bowl and mix. Let the dish sit for 30 minutes at room temperature, season and serve!